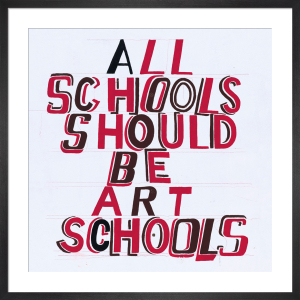 Bob and Roberta Smith is the pseudonym of the British artist whose best-known works include Make Art Not War (Tate), and Letter to Michael Gove, which reprimanded the UK Secretary of State for Education for ‘the destruction of Britain’s ability to draw, design and sing’. Smith uses text as an art form, creating colourful slogans on banners and placards that challenge elitism and advocate the importance of creativity in politics and education. In 2009 he was appointed a Tate Trustee and he is currently Associate Professor at the Sir John Cass Faculty of Art, Architecture and Design at London Metropolitan University.